Moreland City Council acknowledges we are in a state of climate emergency that requires urgent action by all levels of government, including local Councils. This is why in 2017/18, Moreland City Council and Moreland Energy Foundation developed Moreland’s Zero Carbon 2040 Framework. 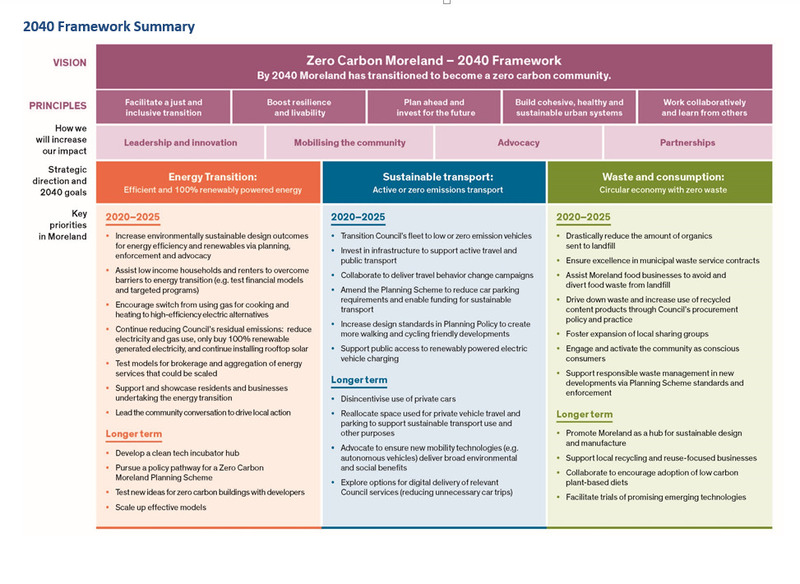 This framework is designed to guide our community to transition to zero carbon by 2040 – 10 years ahead of the State Government’s target for reaching zero emissions in Victoria. What is the 2040 framework? The key priorities for action and advocacy outcomes within the Framework will be reviewed each five years and re-set for the following five-years. This Framework builds on the original 2014 Zero Carbon Evolution (ZCE) Strategy and the ZCE – Refresh to 2020. You can read the full 2014 Zero Carbon Evolution Strategy here (3MB PDF). You can read the full ZCE Refresh to 2020 guide here (5MB PDF). Who is Moreland Energy Foundation? Moreland Energy Foundation Ltd (MEFL) is an independent not-for-profit organisation. We are committed to accelerating the energy transition by empowering communities to take action. We work hard to ensure communities play a meaningful part in this transition and that no one gets left behind.